The Western Mass Pioneers didn’t need to look long or far to find their next head coach. 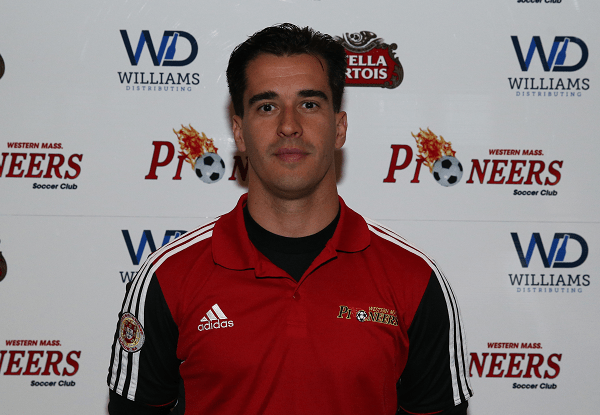 On Sunday, the club hired former assistant coach Dennis Gomes to take the helm of the Pioneers ahead of their 18th season. Gomes, a familiar face at Lusitano Stadium after both playing and coaching for the Ludlow-based side, succeeds Federico Molinari, who took the reins of Western Mass Pro Soccer (ASL) following the 2014 PDL season. The Ludlow native played his youth soccer with Lusitano Football Club, which eventually became the Western United Pioneers. He played at the University of Vermont from 1995-98, but would often return during the summer to suit up for his hometown side. After his playing career concluded, he joined Molinari’s staff in 2011, and served as an assistant through 2014. “Dennis has been a part of this community for a long time now and his dedication to the development of programs and players goes without question,” said Pioneers General Manager Greg Kolodziey in a club release. The Pioneers will kick off their 18th season in early-May.